Normally on Sunday I post a pair of extremely gorgeous shoes with an extremely high price tag. This week I bring you three pairs of extremely gorgeous and fun shoes but with a low price tag! $39.95 to be exact! 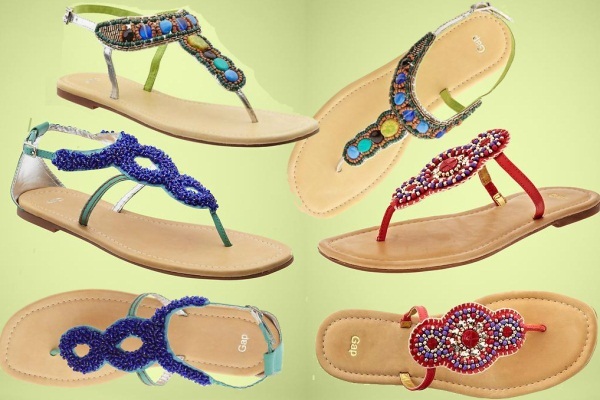 Aren't these sandals from the Gap perfect for summer? The colors are bright and bold and the beading and stone detail is so gorgeous! It is so hard to choose my favorite since all three have such a different personality but I think I'm leaning towards the blue and aqua. I think they would be perfect for walks and dinners at the beach. The red sandals also comes in another color also! Now go shop before they're gone! Do you LOVE or HATE these sandals? Oh my....these sandals pure LOVE! !